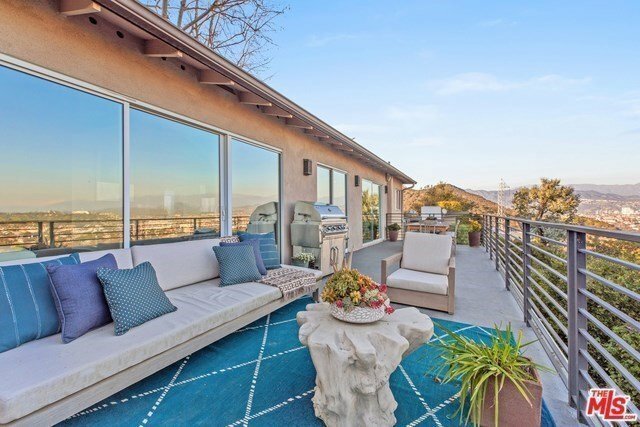 Stunning panoramic views from this updated mid-Century on a prime street in LF Hills. Brightly lit upper level offers a modern, open concept connecting living room, dining area, and kitchen. Floor to ceiling glass sliding doors lead to expansive deck--the perfect place to lounge and dine al fresco while enjoying surrounding hills and city lights. Upstairs includes a screening room with projector+retractable screen. The lower level features a master bedroom highlighted by a fireplace, en-suite bath with jet-tub overlooking the green landscape. Master BR also offers direct access to private deck with fire-pit and an additional upper level lounge deck. Two more bedrooms, a separate bath, and large bonus room with private entrance (perfect office or guest qrtrs), complete the lower level. Long, flat, amply sized backyard includes dog run, as well as elevated wooden deck. Near hiking trails while close to restaurants + boutiques in Los Feliz Village. Your dream of L.A. living is here.